Well I came across this book when trying to look up sibling information and thought the cover alone was funny! Not everyone has the same sense of humor so sorry if this book offends you! I have not read it yet but will let you know once I do and how I feel about it. Here is the product description from amazon! Have you ever read a parenting book that left you feeling inadequate and/or terrified? In other words, have you ever read any parenting book whatsoever? How Not To Kill Your Baby is printed on child-safe, 100% piranha-free paper, and bound without the use of exploding staples. You’ll get no such promise from What To Expect When You’re Expecting. 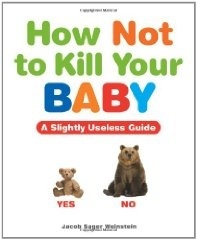 How Not To Kill Your Baby is the book for you… unless you’re some kind of baby-hating creep who wants to parent all wrong. Jacob Sager Weinstein has written for McSweeney’s and Cracked.com, and is a former contributor to The Onion. He’s also written for HBO, NBC, and the BBC. Jacob and his wife live in London with their two children, neither of whom has ever been lost at sea or stuck in the middle of a buffalo stampede. Also, that one time he wasn’t paying attention and the baby carriage rolled into the Regent’s Park Duck Pond, neither of his kids was in it. What more could you want from a parenting expert?